In addition to energy costs, service life, and in particular the requirement profile for LED lighting – i.e. its intended purpose – go hand-in-hand when it comes to optimum energy management. ledxon works not only to present products in their best light, but also in the light that is most appropriate for the product. We have therefore developed a product range that specifically takes into account the needs of retail. We guarantee our customers maximum quality and profitability with respect to brightness, functionality, beam patterns, light colour and of course energy efficiency. Energy-optimising an existing light system is referred to as conversion to LED. The existing situation and the budget available, as well as the aim of the lighting, must be precisely analysed in advance of this process. ledxon offers retrofit products for refrigerated cabinets and ceilings. 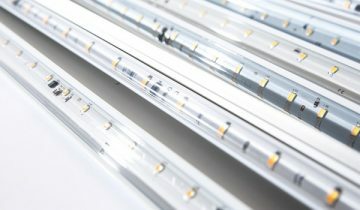 Compared with conventional lighting, these feature an extremely long service life and require less than a third of the energy to provide the same level of brightness. We will be happy to review the profitability of retrofitting for you, as well as providing you with further information on the subject of amortisation. LED lighting has a lot more to offer than just energy savings. Light can set the scene, bringing certain objects into focus. These goods look more valuable and more appetising if they are presented using directional, even lighting in refrigerated cabinets. Product lighting that is individually integrated with the ceiling light inspires an impression of quality and encourages shoppers to buy. LED offers the ideal form of lighting in the refrigerated segment in particular, as the light flow in fact increases as environmental temperature goes down. 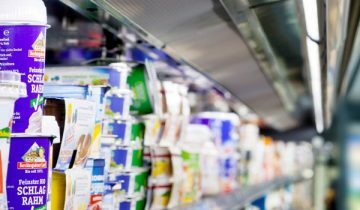 Did you know that 58.8% of food retailers already fully equip their stores with LED lighting, whether for new builds or renovations? Did you know that 26% of power consumption in food retail is used for lighting, and 17% of the total energy consumption goes on heating? LED products convert around 70% of the electrical energy they consume into heat. 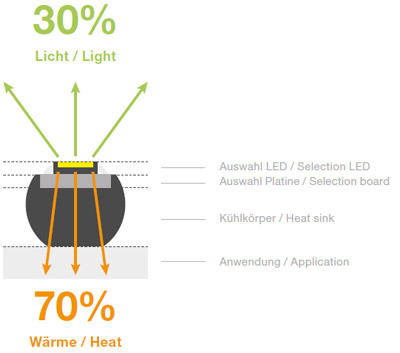 This makes it essential to think more exactingly about thermal/heat management in lighting. This kind of management is key for light output and service life. Both from a technical perspective and for cost reasons, thermal management should be coordinated precisely to the specific requirements and objectives of the relevant use. This is the only way that LED lighting can ultimately achieve the desired service life and corresponding level of illumination. The service life of an LED can be determined using two factors. Firstly, the service life increases as heat build-up in the LED chip decreases. The second element it depends on is the luminous flux, referred to as the L value. Our DLB-S type, for example, has a value of L70. This corresponds to a maximum light degradation of 30% with a service life of over 50,000 hours. The heat-conducting carrier influences these values. Optimum thermal management depends on several factors. 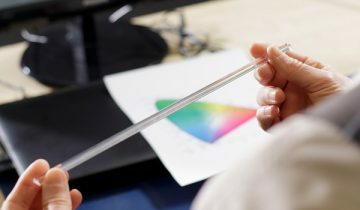 To determine these as precisely as possible, it is particularly important that the area of use for the LED lighting is precisely defined right from the early development phase. ledxon then develops its products taking into account the interactions and dependencies between the individual components in heat management, thereby guaranteeing maximum reliability.